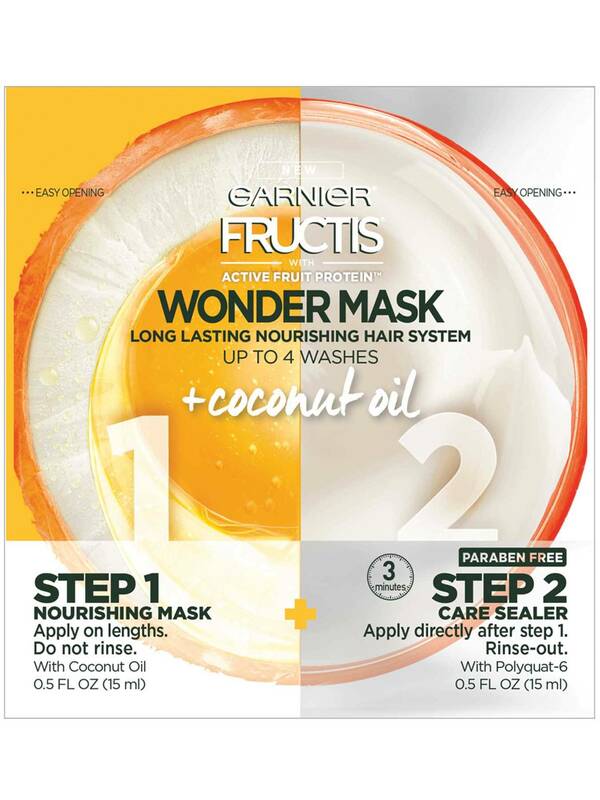 Fructis' new 3-minute mask combines a Nourishing Mask with Coconut Oil and a Care Sealer treatment, to help nourish dry hair until your 4th wash.
1. After shampooing with Triple Nutrition Shampoo, apply the Nourishing Mask on wet hair. 2. Gently massage, paying attention to the lengths and ends. 4. On top of the Nourishing Mask, apply the Care Sealer directly on the lengths. 5. Leave on for 3 minutes. 6. Rinse hair thoroughly. In case of contact with eyes, rinse immediately. Rated 5 out of 5 by Mommy needs a break from Pleasantly Surprised I'm a skeptic when it comes to hair care products. I have thick, curly hair that tends to be dry and brittle if I don't nourish it consistently. I have used a plethora of products and brands. 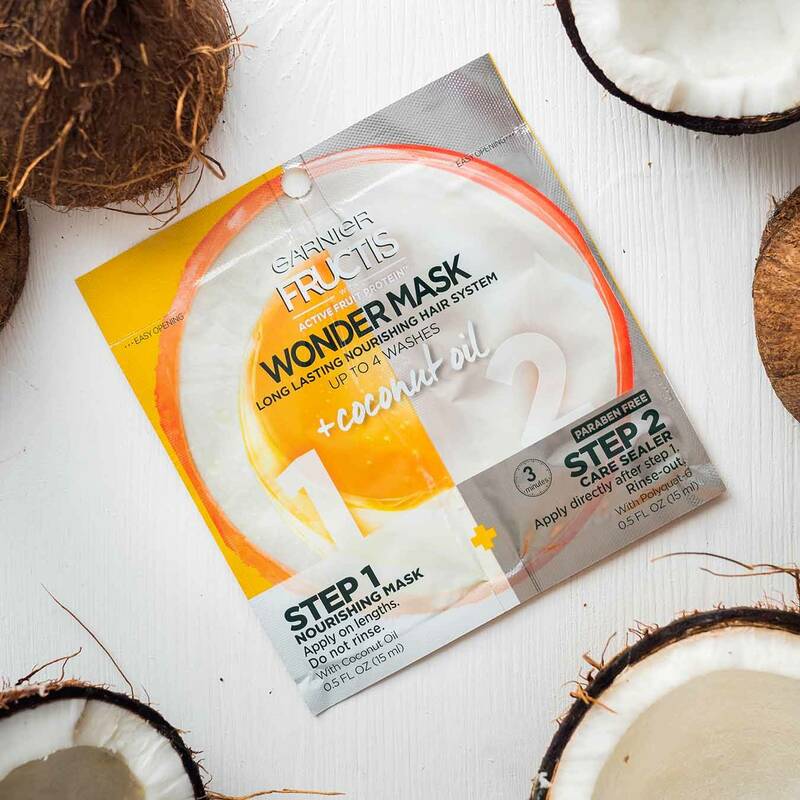 I purchased this hair mask at Target and was so surprised by how much I liked it, I had to write a review. I immediately noticed results after just a few uses. Definitely worth a try. Thank you for this product!!!! Rated 5 out of 5 by N3RDGRRL from Surprising I thought thus product would make my hair feel greasy but quite the opposite, my hair was super soft and felt healthier than it has in a while. Not only did it make my hair feel soft but it smelled amazing. I will be using this again and recommending it to my modeling friends. 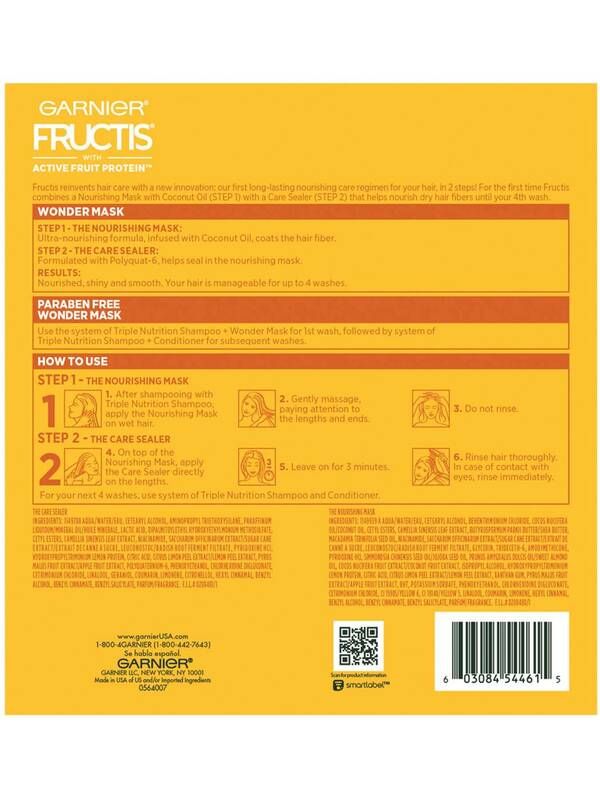 Rated 4 out of 5 by Tcinabon from Garnish fructose mask is the bomb I loved this mask. It didn’t have oarabend in it which was a plus. It handled my really curly hair and made it silky and smooth with not any flyaways. I loved the fragrance as well! Rated 5 out of 5 by Robinorchard14 from No more frizz I used this on my daughters wavy/frizzy hair and within one wash her hair was manageable. It makes your hair soft and easy to tame and style. No more frizz!!! Rated 5 out of 5 by Supu2017 from Works wonderful on my fizzy hairs I used garnier mask+care sealer and I see goos results my hairs are much softer and manageable. Now I don't have to worry about my hairs. Thanks Garnier!! Rated 5 out of 5 by gloriaaa21 from Simply amazing! I have frizzy, unmanageable hair but I noticed incredible results the same day I used this product! My hair was soft and so easy to manage. I’m definitely going to keep buying more. Rated 4 out of 5 by Bloodninja45 from Pretty good This product left my hair feeling soft and smelling good. I'd recommend it to someone with dry hair like my own. I really like how soft it made my hair feel.